Goredale Scar sits on the edge of the 15 million year old Craven Fault which passes from Cumbria along the bottom and eastern edge of the Yorkshire Dales. 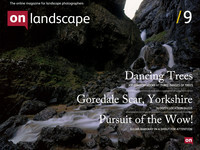 Many classic photographic locations sit on this fault such as Giggleswick, Attermire, Keld Head and Twistleton Scars, Thornton Force, Malham Cove and onto Linton Falls and Trollers Gill. Like Malham Cove, Goredale Scar was (supposedly) created when an ice dam failed north of Malham Tarn and unleashed a maelstrom of water, carving the cove at Malham and creating a huge underground whirlpool at Goredale which subsequently collapsed, forming the open amphitheatre which has the waterfall at one end and the opening of the gorge at the other. Goredale has inspired artists since the early days of the sublime movement. James Ward’s 3mx4m painting for Lord Ribblesdale captures some of the awe inspiring nature of the site (with a little artistic license it must be said). Access to Goredale can be had coming from the north end (near Malham Tarn) which is a small 1.5 mile walk or the simple and quick way, from the south side where there is a half mile walk up a well maintained path that starts at the Goredale camping and campervan site. It is often quite amusing to see people following the public path marked on OS maps as it winds its way up Goredale gorge and then straigh up the waterfall, a route only really recommended for a fit and able with a head for hights and who are happy with some three points of contact scrambling. Don’t try this route with a heavy pack or when the waterful is icy or in full flow (unless you know what you are doing). We’ve made a few 360 panoramas to show you around the area and hopefully give you an idea of what you can get up to. My personal favourite route is to go and have a look at the waterfall itself and then come back out and climb up to the top behind the ever present sandwich van as marked on the map below. There are some great shots to be had looking down into the gorge from the top and if you didn’t have the head for heights to climb the waterfall, you can climb down to the same place from the other side to see the upper falls. While you are at the waterfall, take a look at the areas where the water flows fastest at the bottom of the falls and you’ll see that there is a slow build up of limestone deposit known as ‘tufa’ (the same stuff that the columns in Mono Lake in the US are made of). If you want to get to see some areas that are less well known, take a walk from the top of the falls west south west towards the Malham Lings where there are a couple of trees, some wonderful limestone pavement and a particularly great scree slope and stone wall, all overlooking Kirby Malham and Otterburn (and some great setting sun in the winter).